Aren't you lonely? Do you feel safe? What do you do at restaurants? Those are just a few of the questions that I get asked regularly while traveling alone. I realize that I am new to the international solo-travel game, but so far, I am quite pleased with my decision to experience the world solely with the company of me, myself and I. The truth is that I am rarely alone. In creating the itinerary for this trip, I padded my stays with EatWith dinners, Flytographer sessions, Viator tours, free walking tours, stays with locals through AirBnB (where I've been invited out to parties by my hosts), and a month with a host family through WorkAway. Now there are also apps that make it even easier to travel alone, but never feel lonely. Tourlina is an app for female travelers to meet other female travelers, Vayable hosts tours with locals, Couchsurfing allows budget-friendly travelers to crash on a host's couch for free, MeetUp advertises events for those with common interests to join a group outing....and there are many more! I have opened myself to the social circle of the world and it has been a gracious host. I have ended up engaging in conversation during most dinners, volunteered to take photos for other couples on tours, I've had drinks with people I've met at meals, and I've shared cabs with couples going to the same destination that I was headed because I overheard them asking for a price quote. There are actually very few times that I am alone, and during those times, I enjoy my time to write, watch movies, catch up with friends through texting, and Facetime with family. While I do realize that there is a distinct difference between being alone and lonely, the support that I have received in taking this journey has never once left me feeling isolated. I have yet to be in a situation where I genuinely felt unsafe. Have I felt uncomfortable? Fortunately, I can't say that I have! 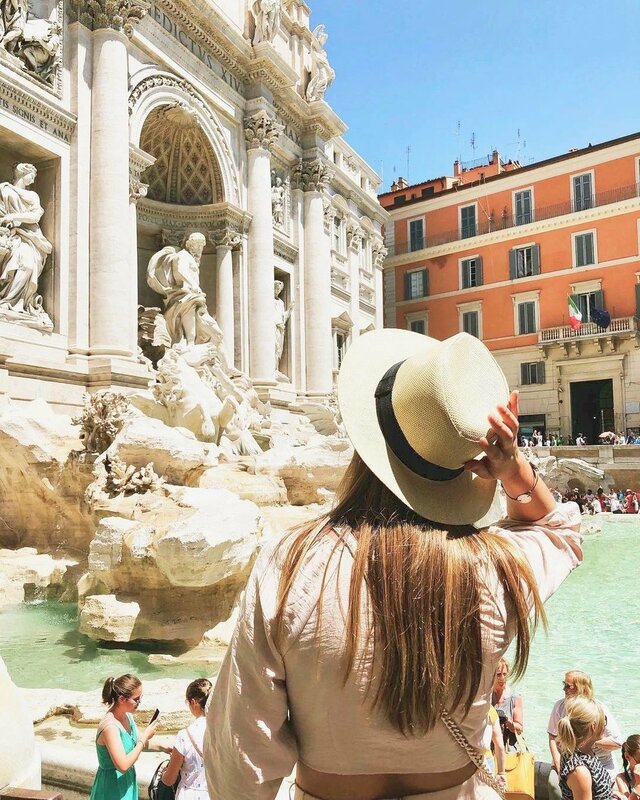 I will say that some men (particularly in Italy) are extremely confused by solo female travelers and consider this as fair warning that this does attract some attention (although, who knows...this may be a positive for some!). A simple grin and passive nod tends to give off the "thank you but no thank you" vibe. I'm never rude, but I don't entertain interest either. I'm an overly (sometimes skeptical) cautious person , so I am always watching my bags, speaking very directly, and staying alert. So far, so good (crossing fingers and praying it stays that way)! What do you do at restaurants? I eat. No really...I make a reservation for one and I enjoy a bottle of wine, appetizers, a full meal, and usually dessert and a cappuccino. Anyone reading this probably knows that I love to eat...and so I make a point to enjoy myself just as I would if I were with someone else. After all, I am one of my favorite people...so why not spend an evening enjoying a good bottle of wine with myself? It's pretty liberating...you should try it! * One thing that I should note: I commonly cork the bottle of wine and take it back to my apartment to finish up while catching up on emails. It is important not to over drink if you are traveling alone. Safety first...and staying alert and competent is key! Do you like traveling at your own pace? Do you trust yourself with directions and logistics (or trust your phone's GPS)? Do you feel confident in communicating with strangers? Are you comfortable eating and walking alone in new settings? If you answered yes, I think that you should go for it! The biggest plus that I have found is that I can stop when I want to, eat where I want to eat, nap when I need to rest (which is rarely), and just follow my instincts towards my next adventure. Sure, I have wished that my husband, friends or family were with me from time to time (I think it would be concerning if I didn't). However, I have met people that I never would have spoken to if I were within a group, I have seen things that I may not have seen if I had a tighter itinerary, and I have experienced things that I could have missed out on if I were not traveling alone. Travel is changing me for the better and I am welcoming this evolution with open arms. I am more confident, competent, and cultured all because I trusted myself to be the best company possible, and you may be surprised how traveling alone could shape you! Have you traveled alone? I'd love to hear about your experience! WHEN IN ROME....EXPLORE AS ROMANS DO: MY EXPERIENCE WITH SCOOTEROMA. When I decided that I would be re-visiting Rome, I knew that I had to find a different way to see the city than I had before. I had been to Rome twice, and it was the second visit that made me fall in love...I couldn't even imagine what the third visit would bring! And then I found ScooteRoma. Yes, it is exactly what you are thinking. I fully committed to the Roman way of life, and decided to explore the city by scooter ("motorino" if you are Italian). As a note, if you are feeling nervous, they have more than just scooter tours! I actually found them through their adorable instagram account that I highly recommend you follow just for kicks. What I discovered in my three hours with ScooteRoma, is that you can explore all corners of the city efficiently (and without further eviscerating my feet). I loved the thrill of weaving in and out of cars (I truly didn't think that I would), rushing through alley ways, and navigating to the front of traffic by snaking through traffic. Considering that I had to buy new sandals on the way to meet Mimmo (my Roman tour guide) because my feet were hurting so much, this relaxing ride was more than welcome. Mimmo met me at a central spot and had my helmet ready to go. He was nice enough, not only to wait for me as I arrived flustered and late, but to also stop for coffee at a fantastically local cafe mid-tour and provided me with some sugary treats to fuel my adventures. A cappuccino and cream filled pastry was exactly what I needed to set the tone for my day whipping through the city's streets! I had planned on walking to the Piazzale Garibaldi to get a view of the city..but Mimmo checked it off my list without even knowing. He took me to the "secret" spots, while also passing through the popular Roman landscapes. I was able to see the Roman forum, the "keyhole" to Rome, the orange garden in Parco Savello, and (what felt like thousands) more in between. There are tours, and then there are tours...this my friends, is worth it. I'm not all for following a tour guide holding an umbrella upside down to mark where they are in the crowds. I can assure you that ScooteRoma provides a more intimate way to see Rome in a way that a Roman would every single day. So why not hop on?! Am I right? You're not alone. It can be hard to fit everything you want to do into a few days, a week, or even two, when you are traveling. I recently learned that Americans are notorious for not taking long enough vacations, and who would disagree? Doesn't everyone want a full month off like the Europeans? So how do you do it? How do you fit it ALL in? How do you come back from vacation less exhausted and burnt out than when you left? Ideally, we vacation to get away from it all, and somehow come back with an emotional (and maybe literal) hangover from trying to pack our days with activities. Obviously, this doesn't always apply. If you are sitting on a beach in Tahiti and reading this, you can stop now...your priorities consist of one thing: do nothing. Ask yourself "why" you are traveling. Really think about it. Are you traveling to relax? Are you traveling to see things that you have never seen? Are you traveling to eat incredibly local foods? If you are aren't a foodie, then you won't want to build your itinerary solely around the best restaurants. It just doesn't coincide with want you want out of your trip. Find out your "why" to help build the foundation of your trip. Now create a list of the "must do's." I ask this of every client. What can't you live without on your trip? For example, mine is always wine. So I would make sure that I am jotting down that I can't live without a trip to the local vineyard, wine room, or unique tasting in the areas that I visit. You might find that this overlaps with your "why." That means you are on the right track! Create a list of the "nice to haves." There are always things that would be good to do/see, but you can live without. If you are into sports, think of this as your second string list. They may be necessary, and can change the game...but they aren't your key players. Now set the pace. Do you want to be on the go everyday? Does walking all day long sync up with your "why?" If your trip is meant to be rejuvenating, I wouldn't suggest trying to pack in lots of sites. However, if you want your trip to be as dense as possible, then who's stopping you? I would suggest that if you are in a big city, you may want to plot out one to two sites a day from your "must do" list and then add in some fluff that would be "nice to have." Fostering my relationship with my "why"
If you go about your planning in a systematic way, and really ask yourself these questions, you are must more likely to feel fulfilled...and hopefully less exhausted! In addition, there are really rockstar websites that can help you build your itineraries now. I prefer using Travefy because they have an app, it syncs with my calendar, creates a PDF, and is just stinkin' easy to use. However, if you still need help after all that, well...that's what we are here for!